Spring Training’s final public act was cancelled Friday when rain washed away a game against the United States Military Academy, a.k.a. Army, at Citi Field, an exhibition that was going to be carried out at West Point until the playing conditions at Doubleday Field at Johnson Stadium were deemed harmful for major leaguers and other living things . It was a nice idea, though, a throwback to when the Mets — picking up on a custom the other New York baseball outfits established and maintained — used to go up the Hudson on a recurring basis. The Mets’ buses pulled into the Point for the first time in 1963. As captured for posterity in Jerry Mitchell’s The Amazing Mets , Casey Stengel (who had visited under the command of John McGraw forty years before) read the Cadets the Orders of the Day in fluent Stengelese. After that, the best and the brightest were on their own. But before that, to properly greet the Mets with the decorum they deserved, a band serenaded Casey’s troops with the tune most closely associated with the new team from Manhattan. And, no, it wasn’t “Meet The Mets,” not yet. The song came from the advertising to which Mets consumption exposed a person, irrespective of rank. That’s still a lovely sound, whether it emanates from quarters military or civilian. Not everything stays in fashion a half-century down the pike. • After eight friendly skirmishes between 1963 and 1984 , the occasional West Point trip was dismissed from the schedule for 33 years; who can tell when reveille will summon the Mets to assemble there again? 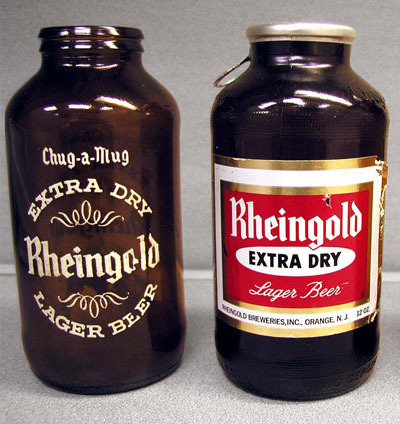 • Rheingold ceased production of beer, dry or otherwise, in the 1970s. An ambitious marketer tried to revive the brand on Opening Day Eve 1998 , contract-brewing it in Utica and arranging for the Mets’ involvement on a limited basis, but the deal ended within a year. • Buffalo, Triple-A rung on the shaky Met growth ladder from 1963 through 1965, roamed back into the organizational fold in 2009…and roamed back out in 2012 . No, you can’t always plug a charger into the wall outlet of nostalgic impulses and expect the battery to register 100%. But cheering when the Mets win has remained the order of every day as far as we’ve been concerned for a solid five-and-a-half decades. We purehearted sorts learned to do it by nature or nurture or both when we were knee-high to a Chug-a-Mug  and proceeded to dig in our heels for the lifetime that followed. Others in whose company we now and then find ourselves tend to choose to await repeated word of positive developments before falling into a frontrunning formation. They weren’t always Mets fans, but they’re Mets fans at a given, usually sunny moment. This happens within the ranks of sports fandom. Even Mets fandom. You don’t need to be an expert at deciphering military code to understand winning helps. With the Mets lately on the march, more New Yorkers than at any time in shortsighted memory, according to one of those springtime surveys that isn’t usually worth the trouble it takes to ignore, have enlisted in our cause. A Quinnipiac poll measuring New York City’s baseball preferences marks the current score Mets 45 Brand Y 43 , reflecting an inevitable reordering of the day. Margin of error beware and all that, but this data jibes with the vibe that’s been in the air since 2015 . The gap will probably widen before it narrows. The Mets have risen and continue to rise tangibly and besides. The other team is doing what it’s doing, and its course of action may benefit them eventually, but these things, no matter the “big brother/little brother” propaganda you were fed and perhaps swallowed for too long, run in cycles. The cycle, after an interminable rain delay of the soul, has finally turned in the direction we deem appropriate. Our team, our time, as a less loved and sadly premature jingle  once put it, was going to arrive sooner or later. That was in the early 1960s, and the waiting Breslin projected as necessary proved worthwhile by 1969. When the wait cycled from a hard-earned nonexistent in 1986 to seemingly endless by the mid-1990s, a certain breed of Long Islander — disconnected by attrition from their blue and/or orange bloodlines — displayed an impatience native to the neighborhoods that developed adjacent to our parkways. Breslin’s informed appraisal notwithstanding, waiting surely did not remain a Long Island instinct. On the cusp of middle age and my team in the doldrums, I stopped coming across as many Mets fans as I did when I was younger. Or as I do now that I’m older and the Mets have remade themselves (until further notice) into a perennial contender. Did I mention winning helps? That’s all right. Even the chronically patient and stubbornly loyal among us, from wherever we hail…we who pride ourselves on not particularly needing to know if the results of the previous night’s Mets game are cheerworthy…strongly prefer victory to the alternative. Quinnipiac also mentioned  something about upstate being less in step with the tenor of the New York baseball times. Given that the Mets ceased making jaunts to West Point; disassociated themselves from Utica-prepared beer; and hoofed it out of Buffalo, those folks north of Yonkers might need more convincing. Maybe a few more rides to the playoffs will further reshape the Empire State of mind. I believe I mentioned winning helps. When the Mets were getting slaughtered in these types of surveys, I bristled, and not just because it was unpleasant to consider. The lack of perspective is what bugged me. There were no permanent “big brothers” or “little brothers” here. There was a kinship to conspicuous success and there were people of dubious depth who relished hitching a ride on a smoothly operating bandwagon. There still are, quite frankly. This strain of New Yorker constitutes the statistically significant difference vis-à-vis transitory popularity. Sometimes they’ll be with us. Sometimes they won’t. As for everybody who isn’t hollow inside, we’re gonna be Mets fans every spring and every season. Now that our team has resumed its long-misplaced local prominence, I more or less shrug at the status. It’s surely swell to see the numbers tilt in the Mets’ favor and I genuinely enjoy that the sight of Mets caps and jackets on trains and in supermarkets has become fairly common rather than practically foreign. But I figured this was coming despite being fed nonsense to the contrary for a generation. I lived through a Mets reign as a kid. I lived through another in relatively early adulthood. New York and environs knew a good thing when they saw it. The reliably good thing will ultimately prevail in the baseball marketplace. The Mets loom as the best thing around as we await delivery of 2017’s first pitch, 1:10 Monday afternoon. By 1:11, the only survey worth tracking will be that which records how many strikes versus how many balls are being thrown by Noah Syndergaard.